Contact Light, the innovation division of digital out-of-home company XTD has made its newly launched EMBARK app available for Vivid Sydney, the world’s largest festival of Light, Music and Ideas. In 2015, Vivid Sydney attracted a record 1.7 million attendees and this year will be bigger and brighter. To assist Vivid Sydney visitors, the free EMBARK app is offering festival goers complete guidance to public transport availability and every Vivid Sydney installation to visit. Contact Light launched EMBARK last week as part of an international release of the new platform which sees the app available for people to use in all major Australian cities as well as in more than 60 cities in 14 countries worldwide. People attending Vivid Sydney and using EMBARK on their mobile devices have instant access to the best public transport options to and from any point in Sydney, as well as navigating to prominent points of interest within and around the Vivid Sydney precincts. “EMBARK’s capabilities are such that as we launch in Sydney, the app will also be fully functional in all Australian capital cities and major regional centres,” said Mike Boyd, CEO of Contact Light. “People who take the free download from the Apple App Store can also use EMBARK in major cities in countries like the USA, UK, Canada, Germany, Spain, New Zealand, Mexico and France. We are already seeing downloads and usage from many major international cities. “With such extensive deployment of EMBARK, we will continue to explore commercial partnerships with major marketers who are reaching for new channels to connect with their mobile populations. 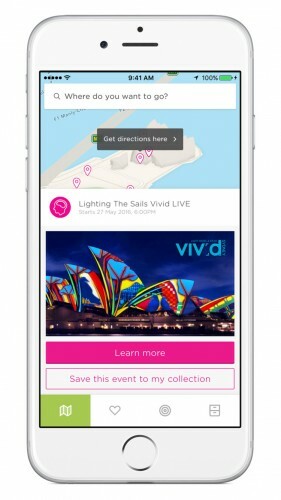 Steve Wildisen, CEO of XTD, said EMBARK’s availability for Vivid Sydney attendees was a perfect demonstration of the app’s capabilities. “EMBARK is a very capable piece of technology and we are already seeing pick up for many international markets after the launch last week,” said Wildisen. XTD is the owner and operator of the world’s first cross track digital media and information system designed for the transit networks of major global cities. In Australia, XTD operates the cross-track media and information systems within the Melbourne and Brisbane metro rail networks and is in discussions for the installation of the systems in two major Asian cities.